Wolfgang Tillmans' new installation of photographic work continues to present a dialogue of both small and large-scale works as he has been doing now for more than a decade. 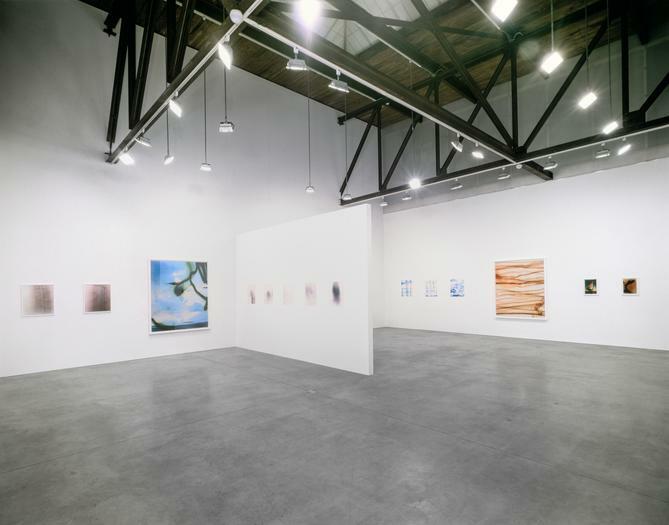 However, as well as Tillmans' exploration into the way size, media and format effect the reception of imagery, this exhibition will also address sequencing of images and the basic nature of photography as light, through experimentation with the purely abstract, unique photographic image. Produced without a camera or negative, the new series Blushes, 2000 are the careful result of the artist filtering light into concentrated areas of color and shadow. Besides these purely abstract works, Tillmans will also show works that combine traditional straight photography with uncertain evidence of the artist's intervention. These ambiguous combinations of figuration and abstraction were first introduced to the public in Tillmans' Parkett Edition, 1992-98, 60 unique works on color-negative photographic paper. The Parkett Edition , a combination of true darkroom mistakes and years of darkroom experimentation that they inspired, not only plays with the notion of a multiple (i.e. : unique prints comprising a multiple) but also accentuates the purely chemical processes inherent in photography. Although these new combinations may look at first glance like darkroom mistakes they are actually carefully orchestrated exercises in composition, revealing an ongoing engagement by the artist with the formal concerns of photography. A third body of work comprised solely of straight photography will depict a series of shots of travelers on underground trains up close and in detail, sharing the incredible anonymous intimacy every commuter experiences. Besides presenting the argument that figurative work and abstract work in photography need not be separate concerns, Tillmans uses the nature of the photographic process itself to dwell upon the concept of transformation. The idea of transmutation suggested by the Blushes and most literally seen in Snow/Ice Grid, 1999, (a grid of images of trampled and melting ice and snow) suggests that experientialism in both art and life is an open invitation to chance that ultimately enriches our entire lives. Wolfgang Tillmans works were recently seen in London at the Turner Prize exhibition at Tate Britain where he was awarded The 2000 Turner Prize; at the Royal Academy of Arts for the exhibition Apocalypse and as part of Whitechapel Gallery's exhibition Protest and Survive.